The Sanskrit word garuda means eagle. In Hindu mythology Garuda is known as the king of birds. He transports the God Vishnu (shown with a bow and arrow in the illustration to the left) and is said to be eager to help humanity fight againt deamons. The Garuda-asana will strengthen the legs, knees and ankles. It stretches and tones muscles of the leg and can help relieve cramps of the legs. Lie flat on the back in the shava-asana (corpse pose). Join the palms of your hands together keeping the fingers pointed upward. Exhale and return to the tada-asana. Repeat the posture on the opposite side, wrapping the right leg over the left and the right arm over left. Duration/Repetitions: Hold the hala-asana for as long as you are comfortable. 20-30 seconds is fine for early attempts, increase the time gradually as you become more comfortable. You can also try holding the posture for as long as you can hold the inhaled breath. Repeat 2 or 3 times on each leg. The Eagle Pose loosens the joints of the legs and strengthens the calf muscles, knees and ankles. It also stretches the outer thighs, hips, shoulders and upper back. This pose opens up the back of the pelvis and also creates a space between the shoulder blades. Eagle Pose increases blood circulation to all joints. Garudasana is a great pose for the central nervous system as it improves focus and concentration and enhances the sense of balance of the body. It alleviates sciatica and rheumatism pain and has therapeutic effects on asthma and low backache patients. 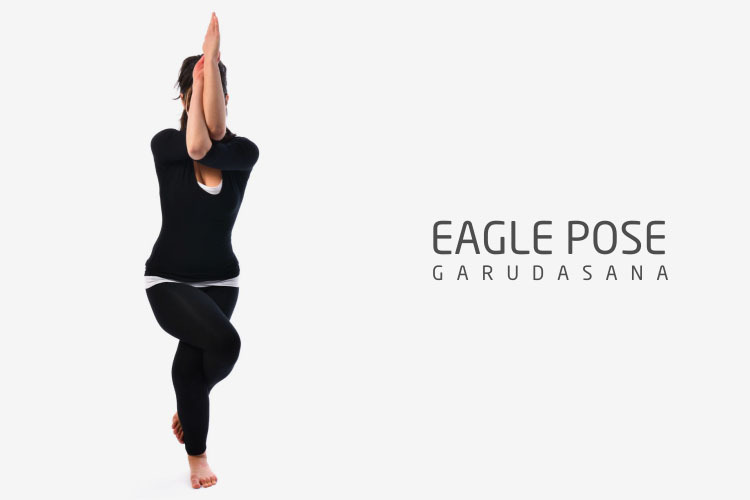 Eagle Pose improves digestion and elimination process of the body and also strengthens the immune system. This pose clears up reproductive problems as it supplies fresh blood to the reproductive system.